Our fanclub is founded on Tuesday 15th June of 1998 to bring fun and real football-passion to football-fans in Holland and Belgium. 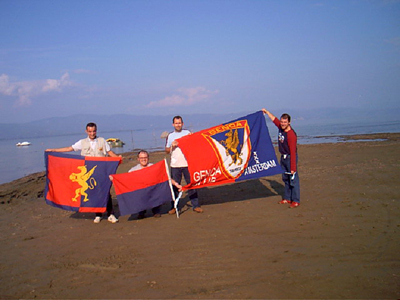 In the 14 years we now exists we found frienship with so many fantastic friends from all over Europe, so we can easily say that for us Genoa is the club with the best supporters in the world and it doesn’t matter if we play in Serie A, B or C-1. 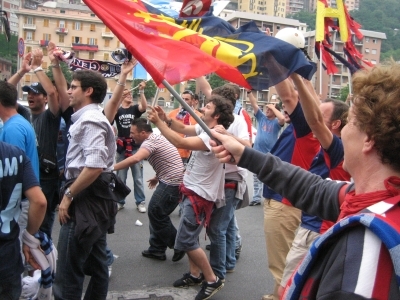 A lot of teams (like the other one in Genova) only are popular at the moment the club is succesful, but even in Serie C-1 for the match Genoa-Fermana the Marassi stadium was more filled than during an Uefa-cup match of Sampdoria in the same season. 22nd October 1999: Genoa-Sampdoria 1-1 (goal of Ruotolo) Our first trip to the first Genovese league-derby in 5 years with a happy end because of the late goal of Ruotolo. We visited the match with 6 persons: Bart, John, Maarten, Rocco, Monica and Hans while Sylvia and 9 months old Iris stayed in the hotel. 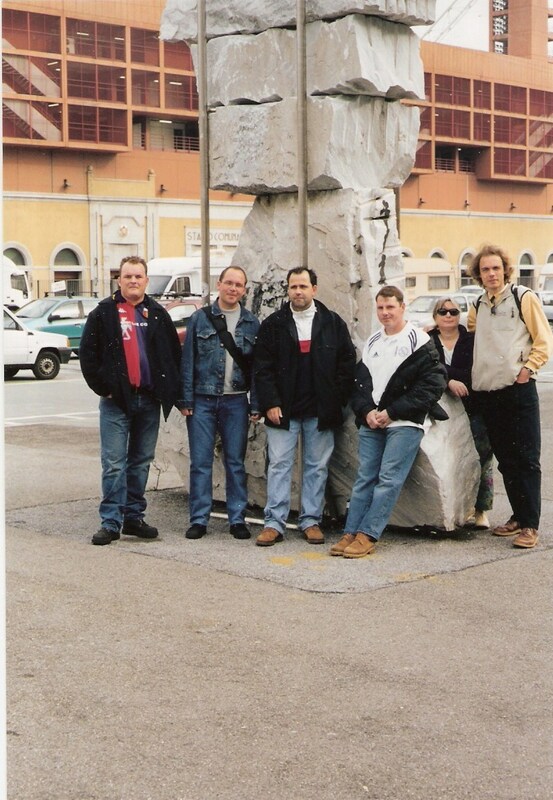 14th January 2000: Genoa-Napoli 0-1 During this 4 day trip we visited 3 matches: Juventus-Lazio (Coppa Italia), Genoa-Napoli (Serie B) and Bologna-Bari (Serie A). Henk, Bart, John and Hans stayed 2 nights in Hotel Fiume in Genova and 1 night in the house of Andrea Agostini in San Lazzaro di Savena. 2nd April 2001: Genoa-Sampdoria 2-0 (goals Mutarelli, Stroppa) Maybe our best trip ever. We stayed on this 5-day trip in Hotel Cristal in Pietra Ligure and we had a fantastic barbeque with Rocco, Monica, Anna and Eugenio on the beach. Bart, John, Patrick, Marcel, Ernst-Jan, Tim (Belgian), Sylvia and Hans also visited Milan – Lazio in the San Siro stadium. 5th November 2001: Genoa-Sampdoria 1-0 (Branco-gol of Francioso) Because of a terrible accident in Gotthard-tunnel 10 Dutch Genoani had to drive over 200 kilometres extra in Switserland to arrive in Genova for this fantastic derby with the great freekick goal of Francioso. We visited the match with the most members ever. The 13 heroes of this unforgettable trip: Bart, Ernst-Jan, Marcel, Stijn, Ted, Harke, Helena, Edwin, Marike, Hans, Rocco, Monica, Alessandro. 13th October 2002: Venezia-Genoa 0-1 (goal of D’Isanto) Our first away-match of Genoa. 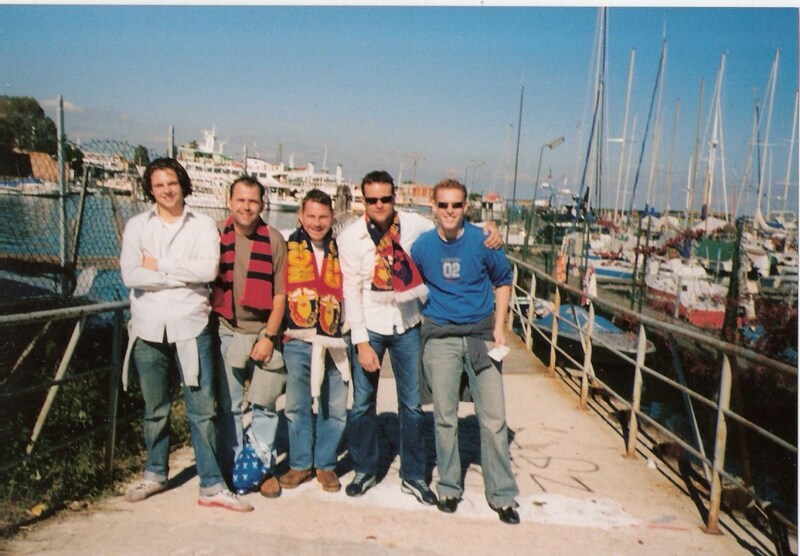 John, Bart, Max, Willem and Hans stayed 3 nights in hotel Nettuno in Lido di Jesolo and went by boat to the match. 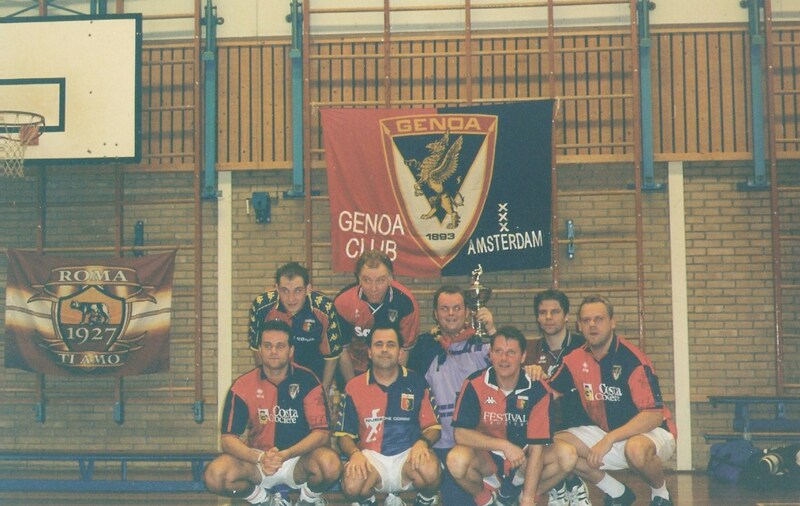 15th February 2004: Genoa-Torino 2-1 (goals: Foglio, Rossi) With 9 Dutch Genoani (John, Bart, Ernst-Jan, Marcel, Willem, Max, Tim T., Martijn and Hans) we flew with Easy-Jet to Nice and drove with 2 cars to Genova. 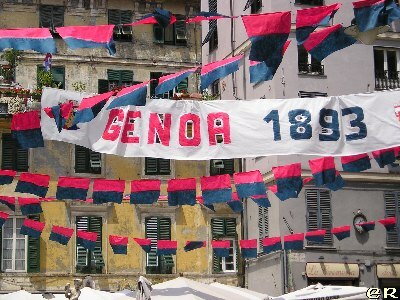 Because of Valentines-day we showed the banner “Genoa you are our valentine” in Distinti. 11th June 2005: Genoa-Venezia 3-2 (goals: Milito (2x), Rossi) One week after the fantastic trip to Piacenza, Bart and Hans returned together with Sylvia, John and Tim T.. For 3 days we celebrated the promotion to Serie A. 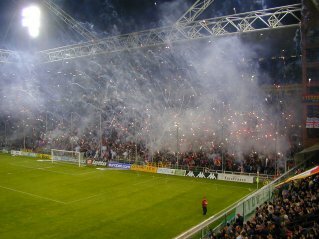 10th June 2007: Genoa-Napoli 0-0 Two years after the disaster against Piacenza and Venezia finally the promotion to Serie A after 11 years in Serie B and 1 year in C-1. The promotion together with our friends of Napoli ended in one big party with the fans of both sides. This is what football makes fantastic ! 7th October 2007: Genoa-Cagliari 2-0 (goals: Borriello, Di Vaio) 111 months after the foundation of Genoa Club Amsterdam our first match in Serie A. Of course we started with a victory by goals of one of the best strikers of Genoa ever: Marco Borriello and one of my idols that has become a friend: Marco di Vaio. 14th September 2008: Genoa-A.C. Milan 2-0 (goals: Sculli and Milito) The first match of Diego Milito back home 3 years after Genoa-Venezia. Genoa played one of the best matches of the season against the team of Milan with famous players like Maldini, Ronaldinho, Shevchenko and Pato. Diego Milito let Beppe Sculli score the first goal and decided the match by scoring the 2nd goal. 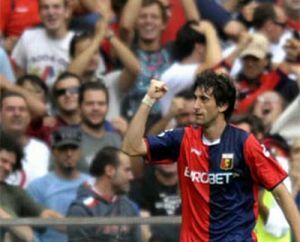 3rd May 2009: Genoa-Sampdoria 3-1 (3 goals of Milito) After Diego scored the only, so winning, goal in the first derby he also scored all 3 goals in this second derby of the season. Genoa Club Amsterdam was present in Distinti with 7 members this memorable Sunday-evening: Jamie, Fabio, Andy, Stefanie, Iris, Sylvia and Hans. All Sampdoria-fans can be happy, Milito played so extremly good this season (24 goals) that the next years he will play with Inter, but be prepared our “Principe of Baires” once returns and will beat you again and again. 28th November 2009: Genoa-Sampdoria 3-0 (goals: Milanetto, Rossi and Palladino). The third derby victory in a row. Also without Ferrari, Thiago Motta and Milito we can beat the ugly kid of Bari and his 10 cousins. Genoa played a long time with 10 against 11 after the red card of Biava, but also in this period we were the best team in the field while Marco Rossi also scored the second goal at this time. After the last goal all Doriani went completely crazy when goalscorer Palladino made clear with his hand that he did not hear Gradinata Sud. 8th May 2011: Genoa-Sampdoria 2-1 (goals Floro Flores and Boselli). The fifth of the last 6 derbies that ended in a Rossoblu victory. This one will always be the most strange one. Because Sampdoria was already with 1 leg in Serie B all Genoa-fans wanted our team to kick the Blucerchiati definitively out of Serie A. In the days before the match in the city and the newspapers the rumours said that Genoa would help Sampdoria with a draw so there will be also 2 derbies next year. During the second half with the score 1-1 it looked like the rumours were true, so the Genoani started to sing: “il derby non si regala” (you don’t give away the derby as a present). After 96.11 minutes it was Mauro Boselli who scored 2-1 in the very last second of the match. 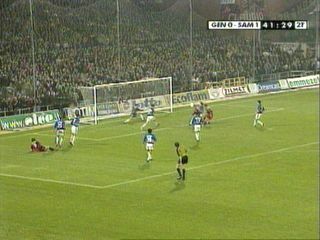 This goal made this match forever the “Boselli-derby” and had historical value: Sampdoria relegated to B and Milanetto and Dainelli had to leave Genoa because the fans still believe that these two players made an appointment with Palombo of Sampdoria to draw the derby.